Zion Market Research has published a new report titled “Water Testing and Analysis Market by Product (TOC Analyzers, pH Meters, Dissolved Oxygen Analyzers, Conductivity Sensors, and Turbidity Meters), by Product Type (Portable, Handheld, and Benchtop), and by Application (Laboratory, Industrial, Environmental, and Government): Global Industry Perspective, Comprehensive Analysis and Forecast, 2017 - 2024”. 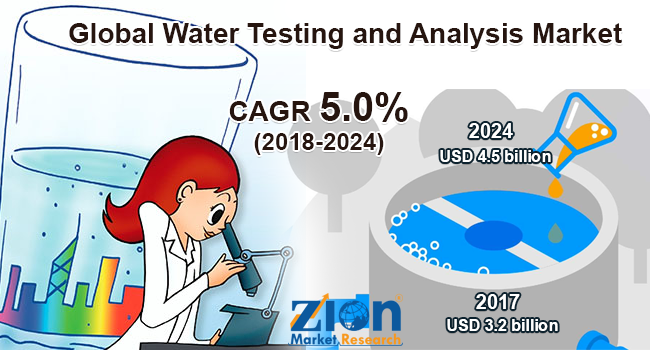 According to the report, global water testing and analysis market was valued at approximately USD 3.2 billion in 2017 and is expected to generate revenue of around USD 4.5 billion by the end of 2024, growing at a CAGR of around 5.0% between 2017 and 2024. The term "water quality" is used to describe microbiological, physical, and chemical properties of water for specific use. Dissolved substances are used to determine the properties of water. Water resources are subject to ever-increasing pollution pressure, the overgrowing demand of water for drinking purposes and other uses is expected to drive water testing and analysis market growth over the forecast period. The determination of the microbiological and chemical quality of water supplies is required to establish the need for and adequacy of treatment, and protect human health. The Department of Health, Water Affairs, and Forestry, in partnership with the Water Research Commission, embarked on a venture to produce various user-friendly guidelines for water. Environmental health officers are required to assess the domestic quality of water while it is being used or distributed. Water quality is an important issue that is being faced in the past few decades. It is of major concern in regions such as eastern Massachusetts, which is water-rich with various rivers, streams, lakes, and ponds. The Massachusetts Water Resources Authority (MWRA), provides safe drinking water and are engaged in upgrading sewage treatment for 2.5 million people and 5,500 industries. Increased knowledge about diseases and environment protection and requirement of strict legislation such as Clean Water Act and Safe Drinking Water Act are influencing people to concentrate on water quality. Such factors are expected to drive the industry growth over the forecast period. The water testing and analysis market are segmented on the basis of the product which is further divided into dissolved oxygen analyzers, turbidity meters, TOC analyzers, conductivity sensors, and pH meters. Conductivity sensors contributed a significant revenue share in 2017, the conductivity of water allows to measure ionic constituents of all types of water such as surface waters, process waters in water supply, and treatment plants. Based on product type, the water testing and analysis market are segmented into benchtop, portable, and handheld. Portable products held significant revenue share in 2017. The growth is attributed due to lack of clean drinking water and rising environmental water pollution. Portable products provide accurate and precise technologies for monitoring water quality. Based on application, the market is categorized as a laboratory, industrial, environmental, and government. Growing industrial applications for water testing and analysis coupled with increasing government and private funding to address environmental issues is expected to drive segment growth over the forecast period. Asia Pacific, North America, Latin America, Europe, and the Middle East & Africa are regional segments of the global water testing and analysis market. Europe held a significant revenue share in 2017. The growth is attributed due to the presence of major industries in the region. The Asia Pacific is predicted to exhibit lucrative opportunities for water testing and analysis. Increasing environmental water pollution in the region is the foremost factor which is expected to drive industry growth in the region. Some of the major players operating in the water testing and analysis market are Emerson Electric Co., Danaher Corporation, Agilent Technologies Inc., Myron L Company, Global Treat, Inc., Horiba, Ltd., Shimadzu Corporation, ABB Ltd., CHEMetrics, Inc., Thermo Fisher Scientific, Inc., Tintometer GmbH, General Electric Company, Mettler-Toledo International Inc., Eisenmann Corp., and Honeywell International Inc.